Something horrid is spreading in the great outdoors... While fetching dinner for her internal medicine team, medical student Annabel Tilson comes face-to-face with Jae Nixon, a park ranger in need of medical care. Ever the Good Samaritan, she gives him a ride to the hospital where he is diagnosed with the flu and sent home. Around the same time, her best friend on the rotation has no energy to spare. He drops out due to a diabolical and mysterious disease. A super medical thriller based on real organisms and a growing national threat. Jae Nixon’s illness soon returns and is more than Annabel, her teammates, and a bewildered infectious disease specialist can account for. As the team investigates the organisms that may be responsible, their numbers continue to grow. But meanwhile … Jae’s life hangs in the balance. Book Four in the medical and personal adventures of Dr. Annabel Tilson and the 2018 Medical Thriller Finalist of the National Indie Excellence Awards. 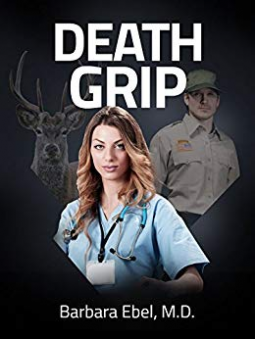 Death Grip is available for purchase in print and ebook formats.